We love our Hama Beads. I think they are a great activity for developing little hands and my daughter says they are a lovely “calming activity”. My son likes the patterns, and enjoys the challenge of copying the pictures. 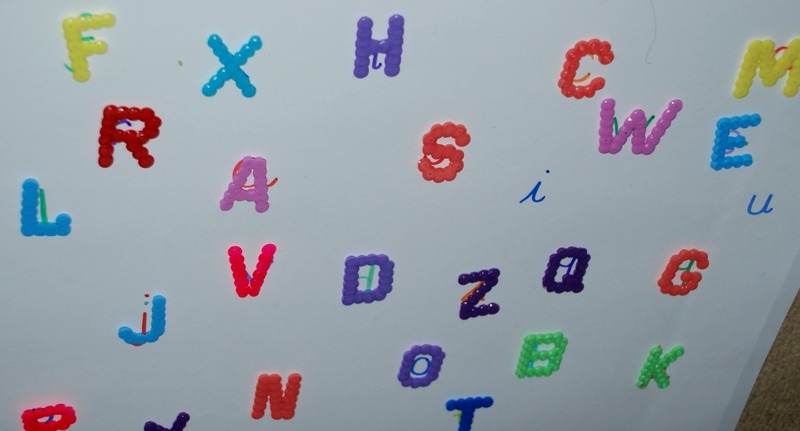 I bought the Hama Bead letter pegboard (affiliate link) for my daughter around 2 year ago when she was struggling with her letter formation. I thought it might help her to make the letters with the pegs, not sure if it did or not, we did lots of those type activities so I honestly can not say which ones worked. But she did the letter peg board a number of times and enjoyed using it. Lately my son has been working on his letter formation, unlike his sister (she learnt her lower case letters first and then his upper case letters) my little man is determined to learn both lower case and upper case letters at the same time. I think it is being around his older sister he naturally is aware of what she is doing and wants to join in and he can be very determined when he wants to and will often attempt to teach himself. So I thought it might be fun to use the Hama Beads in an Upper case / Lower case letter matching activity. We used our pegboard to make the Upper case letters (both kids helped), I ironed them and hid them in our rainbow rice tub. I also wrote out all the letters of the alphabet on a large piece of paper (all lower case). Little man had to search in the rice for the letters and then match the upper case Hama letter to his lower case letter on the piece of paper. 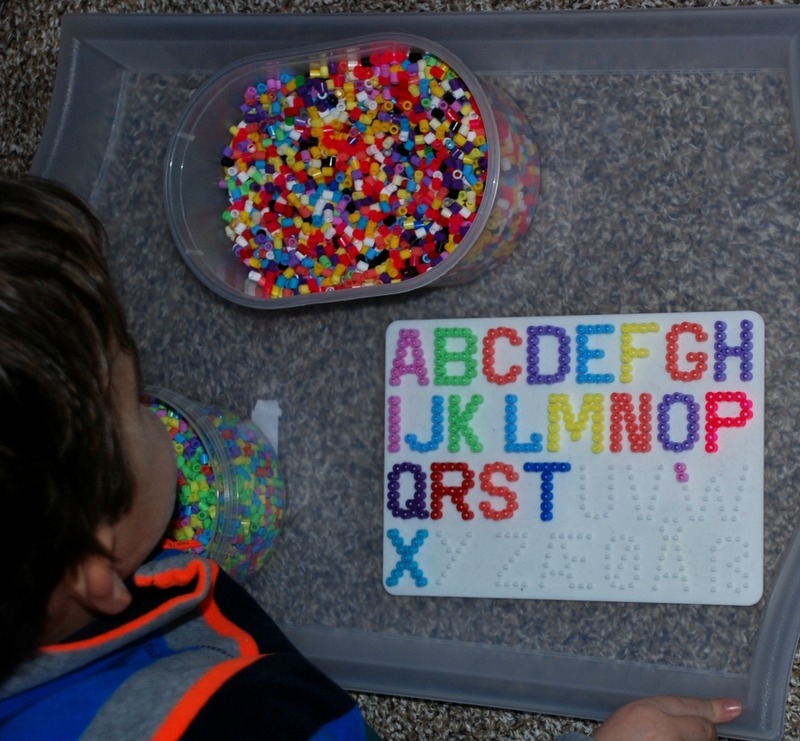 This served as a double activity for him – he was practicing matching his upper case letters to his lower case letters and he was also “working on his tactile defensiveness”. Our rainbow rice is made by adding some rice, food colouring and some vinegar into a zip lock bag and then giving it a good shake (kids do this for me). Once all the rice is covered we pour our rice onto trays and let it dry overnight. Easy, and we have never had an issue with the colour coming off onto the kids hands. The amount of food colouring that you need to add depends on how bright you want the colour to be (just a note the UK food colouring does not produce the same bright colours as the American food colouring). 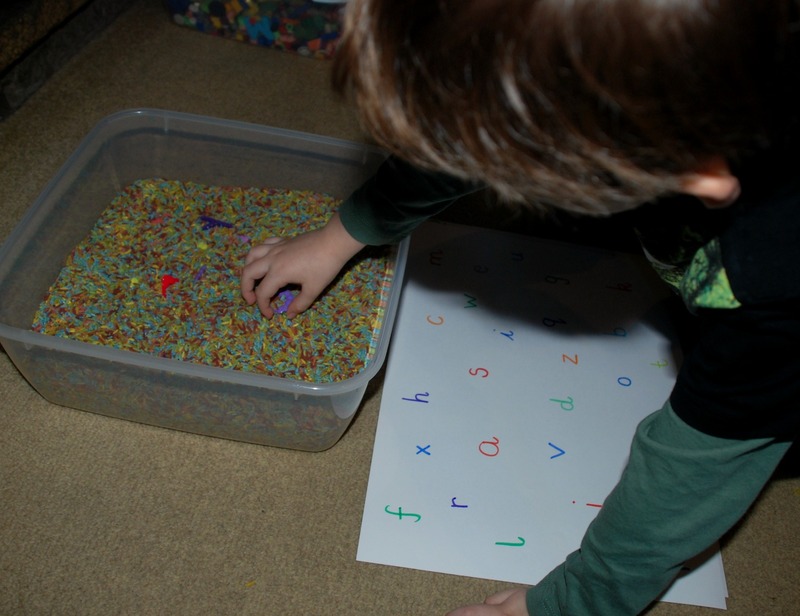 This entry was posted in Homeschooling and tagged home ed, homeschooling, learning letters and sounds, sensory activities, Upper case and lower case letters. Bookmark the permalink. Love the rainbow rice tub! What a fun activity for learning the alphabet.